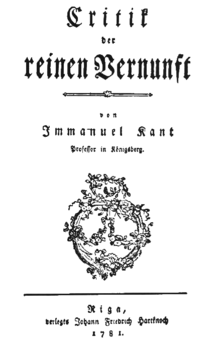 The Critique of Pure Reason (Kritik der reinen Vernunft) is a 1781 book by the German philosopher Immanuel Kant, in which the author seeks to determine the limits and scope of metaphysics. A heavily-revised second edition was published in 1787. Also referred to as Kant's "First Critique", it was followed by the Critique of Practical Reason (1788) and the Critique of Judgment (1790). In the preface to the first edition, Kant explains that by a "critique of pure reason" he means not "a critique of books and systems, but of the faculty of reason in general, in respect of all knowledge after which it may strive independently of all experience" and that he aims to reach a decision about "the possibility or impossibility of metaphysics". The First Critique is often viewed as culminating several centuries of early-modern philosophy, and inaugurating modern philosophy. Kant builds on the work of empiricist philosophers such as John Locke and David Hume, as well as rationalists such as Gottfried Wilhelm Leibniz and Christian Wolff. He expounds new ideas on the nature of space and time, and tries to provide solutions to Hume's scepticism regarding human knowledge of the relation of cause and effect, and René Descartes' scepticism regarding knowledge of the external world. This is argued through the transcendental idealism of objects (as appearance) and their form of appearance. Kant regards the former "as mere representations and not as things in themselves", and the latter as "only sensible forms of our intuition, but not determinations given for themselves or conditions of objects as things in themselves". This grants the possibility of a priori knowledge, since objects as appearance "must conform to our cognition . . . which is to establish something about objects before they are given to us". Knowledge independent of experience Kant calls "a priori" knowledge, while knowledge obtained through experience is termed "a posteriori". According to Kant, a proposition is a priori if it is necessary and universal. A proposition is necessary if it could not possibly be false, and so cannot be denied without contradiction. A proposition is universal if it is true in all cases, and so does not admit of any exceptions. Knowledge gained a posteriori through the senses, Kant argues, never imparts absolute necessity and universality, because it is always possible that we might encounter an exception. For instance, the a posteriori proposition 'the sun rises every day' cannot be true a priori: it may be the case that one day the sun does not rise, therefore only experience can make it true. On the contrary, the proposition '8 is larger than 2' is a priori and always true, independently of experience. Kant further elaborates on the distinction between "analytic" and "synthetic" judgments. According to Kant (and previous philosophers such as Hume), a proposition is analytic if the content of the predicate-concept of the proposition is already contained within the subject-concept of that proposition. For example, Kant considers the proposition "All bodies are extended" analytic, since the predicate-concept ('extended') is already contained within—or "thought in"—the subject-concept of the sentence ('body'). The distinctive character of analytic judgements was therefore that they can be known to be true simply by an analysis of the concepts contained in them; they are true by definition. In synthetic propositions, on the other hand, the predicate-concept is not already contained within the subject-concept. For example, Kant considers the proposition "All bodies are heavy" synthetic, since the concept 'body' does not already contain within it the concept 'weight'. Synthetic judgments therefore add something to a concept, whereas analytic judgments only explain what is already contained in the concept. To accomplish this goal, Kant argued that it would be necessary to use synthetic reasoning. However, this posed a new problem: how is it possible to have synthetic knowledge that is not based on empirical observation; that is, how are synthetic a priori truths possible? This question is exceedingly important, Kant maintains, because he contends that all important metaphysical knowledge is of synthetic a priori propositions. If it is impossible to determine which synthetic a priori propositions are true, he argues, then metaphysics as a discipline is impossible. The remainder of the Critique of Pure Reason is devoted to examining whether and how knowledge of synthetic a priori propositions is possible. Kant writes: "Since, then, the receptivity of the subject, its capacity to be affected by objects, must necessarily precede all intuitions of these objects, it can readily be understood how the form of all appearances can be given prior to all actual perceptions, and so exist in the mind a priori" (A26/B42). Appearance is then, via the faculty of transcendental imagination (Einbildungskraft), grounded systematically in accordance with the categories of the understanding. Kant's metaphysical system, which focuses on the operations of cognitive faculties (Erkenntnisvermögen), places substantial limits on knowledge not founded in the forms of sensibility (Sinnlichkeit). Thus it sees the error of metaphysical systems prior to the Critique as failing to first take into consideration the limitations of the human capacity for knowledge. According to Heidegger, transcendental imagination is what Kant also refers to as the unknown common root uniting sense and understanding, the two component parts of experience. Transcendental imagination is described in the first edition of the Critique of Pure Reason but Kant omits it from the second edition of 1787. The Transcendental Aesthetic, as the Critique notes, deals with "all principles of a priori sensibility". As a further delimitation, it "constitutes the first part of the transcendental doctrine of elements, in contrast to that which contains the principles of pure thinking, and is named transcendental logic". In it, what is aimed at is "pure intuition and the mere form of appearances, which is the only thing that sensibility can make available a priori". It is thus an analytic of the a priori constitution of sensibility; through which "Objects are therefore given to us . . . , and it alone affords us intuitions". This in itself is an explication of the "pure form of sensible intuitions in general [that] is to be encountered in the mind a priori". Thus, pure form or intuition is the a priori "wherein all of the manifold of appearances is intuited in certain relations". from this, "a science of all principles of a priori sensibility [is called] the transcendental aesthetic". The above stems from the fact that "there are two stems of human cognition . . . namely sensibility and understanding". This division, as the critique notes, comes "closer to the language and the sense of the ancients, among whom the division of cognition into αισθητα και νοητα is very well known". An exposition on a priori intuitions is an analysis of the intentional constitution of sensibility. Since this lies a priori in the mind prior to actual object relation; "The transcendental doctrine of the senses will have to belong to the first part of the science of elements, since the conditions under which alone the objects of human cognition are given precede those under which those objects are thought". In the Transcendental Logic, there is a section (titled The Refutation of Idealism) that frees Kant's doctrine from any vestiges of subjective idealism, which would either doubt or deny the existence of external objects (B274-79). However, Senderowics warns that "... If the Refutation of Idealism indeed addresses a question left unanswered by the previous introductory pages of the Critique of Pure Reason, Kant's preceding comments contain a gap that needs to be bridged." Kant's distinction between the appearance and the thing-in-itself is not intended to imply that nothing knowable exists apart from consciousness, as with subjective idealism. Rather, it declares that knowledge is limited to phenomena as objects of a sensible intuition. In the Fourth Paralogism ("... A Paralogism is a logical fallacy"), Kant further certifies his philosophy as separate from that of subjective idealism by defining his position as a transcendental idealism in accord with empirical realism (A366–80), a form of direct realism. [a] "The Paralogisms of Pure Reason" is the only chapter of the Dialectic that Kant rewrote for the second edition of the Critique of Pure Reason. In the first edition, the Fourth Paralogism offers a defence of transcendental idealism, which Kant reconsidered and relocated in the second edition. Critique of Pure Reason. Translated by Werner S. Pluhar. Hackett Publishing. 1996. ISBN 978-0-87220-257-3. ^ Empirical realism was later adopted by J. G. Fichte and G. W. F. Hegel. ^ Kant 1999, p. A2/B2. ^ Kant 1999, p. B4. ^ Kant 1999, Introduction, Part IV, p. A6/B10. ^ Kant 1999, pp. A6–7/B10–11. ^ Kant 1999, p. B12. ^ a b Kant 1999, p. B20. ^ a b Leibniz, G. W. (1996). New Essays on Human Understanding. Translated and edited by Remnant and Bennett. Cambridge University Press. p. 361. ISBN 0-521-57660-1. ^ a b Russell, Bertrand (1990). The Problems of Philosophy. Hackett Publishing Company. p. 57. ISBN 0-87220-099-X. ^ Charles George Herbermann; et al. (eds.). The Catholic encyclopedia. 10. p. 232. ^ Angeles, Peter A. (1992). Eugene Ehrlich (ed.). The Harper Collins Dictionary of Philosophy. Harper Collins. p. 149. ISBN 0-06-461026-8. ^ a b c Kant 1999, p. A21/B36. ^ Kant 1999, p. A22. ^ Kant 1999, p. A19/B33. ^ a b Kant 1999, p. A20/B34. ^ Kant 1999, p. A15/B29. ^ Kant 1999, p. A21/B35. ^ Kant 1999, p. A16/B30. ^ Allison, Henry E. (2004). Kant's Transcendental Idealism. Yale University Press. p. 19. ISBN 978-0-3001-0266-6. ^ Robert Maynard Hutchins, ed. (1952). Great Books of the Western World. 42. William Benton/Encyclopædia Britannica Inc. p. 24. LCCN 55-10348. ^ a b c d Sebastian Gardner. Routledge Philosophy Guidebook to Kant and the Critique of Pure Reason. ISBN 0-415-11909-X. ^ Daniel Breazeale; Tom Rockmore, eds. (2010). Fichte, German Idealism, and Early Romanticism. Rodopi. p. 20. ^ Tom Rockmore (2003). Before and After Hegel: A Historical Introduction to Hegel's Thought. Hackett Publishing. p. xviii. Hegel follows Kant ... in limiting claims to know to the empirically real. In short, he adopts a view very similar to Kant's empirical realism. ^ Chadwick & Cazeaux 1992, p. 104. "... the self is an intrinsically important topic and absolutely central to Kant's philosophy ..."
^ Kant 1999, p. A51/B75. ^ Kant 1999, p. A63/B87. ^ Kant 1999, p. A63/B88. ^ a b Kant 1999, pp. 8–9. ^ Kant 1999, p. A70/B95. ^ Kant 1999, p. A80/B106. ^ Heidegger, Martin (1997). Phenomenological Interpretation of Kant's Critique of Pure Reason. Indiana University Press. p. 292. ISBN 0-253-33258-3. In the schematism Kant attempts to grasp the synthesis a priori of the productive power of imagination in a unified and original manner. ^ Hartnack, Justus (2001). Kant's Theory of Knowledge: An Introduction to the Critique of Pure Reason. Hackett Publishing. p. 87. ISBN 0-87220-506-1. ^ Atkins, Kim, ed. (2005). Self and Subjectivity. Wiley-Blackwell. p. 48. ISBN 1-4051-1204-2. Our understanding and experiences are limited a priori to the modes of representation enabled by the categories. Importantly the categories only produce knowledge (or experience, that is, empirical concepts) when they are applied to intuitions. It is this principle that runs through all of Kant's arguments in the Paralogisms of Pure Reason. ^ Atkins 2005, p. 49. ^ Atkins 2005, pp. 49–50. ^ Bennett, Jonathan Francis (1974). Kant's Dialectics. CUP Archive. p. 72. ISBN 0-521-09849-1. Since the fourth paralogism is misplaced, I shall say no more about it. ^ Sorensen 2003, p. 294. ^ Allison 2004, p. 397. ^ Copleston 1994, p. 183. ^ Beiser 1987, p. 4. ^ Beiser 1987, pp. 172–173. ^ Beiser 1987, pp. 173–178. ^ Beiser 1987, pp. 179, 181–182. ^ Beiser 1987, pp. 181, 184, 186–189. ^ Beiser 1987, pp. 193–195, 197–198. ^ Graham Bird (2005). Ted Honderich (ed.). The Oxford Companion to Philosophy, Second Edition. Oxford: Oxford University Press. p. 470. ISBN 0-19-926479-1. Hanna, Robert. "Kant's Theory of Judgment". In Zalta, Edward N. (ed.). Stanford Encyclopedia of Philosophy.